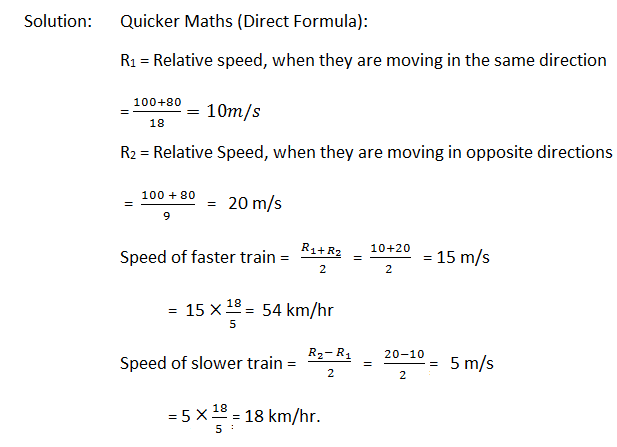 18 km/hour = 5 metre/second, can be used to convert the speed given in km/hour to metre/second or vice - versa. 1. How long will a train 130m long travelling at 40 km an hour take to pass a kilometer stone? 2. How long will a train 60 m long travelling at 40 km an hour take to pass through a station whose platform is 90 m long? 4. Find the length of a bridge which a train 130 m long, travelling at 45 km an hour, can cross in 30 secs. 5. The length of the train that takes 8 seconds to pass a pole when it turns at a speed of 36 km/hr is __________________ metres. 6. A train 50 metres long passes a platform 100 metres long I 10 seconds. The speed of the train is _____________ km/hr. 7. How many seconds will a train 60 m in length, travelling at the rate of 42 km an hour, take to pass another train 84 m long, proceeding in the same direction at the rate of 30 km an hour? 9. Two trains running at the rates 45 and 36 km an hour respectively, on parallel rails in opposite directions, are observed to pass each other in 8 seconds, and when they are running in the same direction at the same rate as before, a person sitting in the faster train observes that he passes the other in 30 seconds. Find the lengths of the trains. 10. Two trains measuring 100 m and 80 m respectively, run on parallel lines of rails. When travelling in opposite directions they are observed to pass each other in 9 seconds, but when they are running in the same direction at the rates as before, the faster train passes the other in 18 seconds. 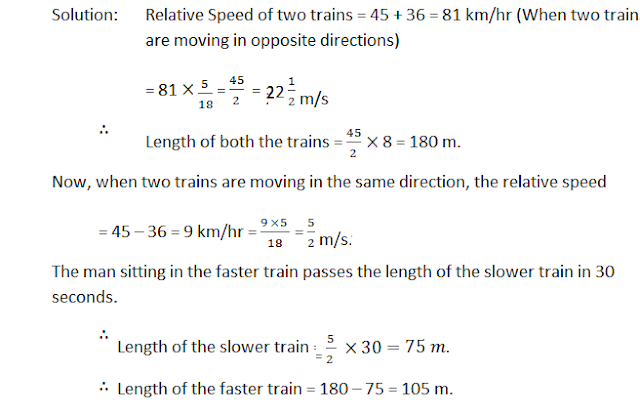 Find the speed of the two trains in km per hour.